Since I picked up my first DSLR in 2008, I have admired and followed Jay Dickman, a long-time Olympus Visionary and National Geographic photographer. There has always been a secret ambition to achieve the elusive “Visionary” status as I became a photographer myself. Strangely, I got involved with Olympus, albeit in a completely different relationship. I was officially under their employment as a product specialist for more than three years. I left my job with Olympus in early 2017 and a lot of things have happened since. When I was invited to join the Olympus Visionary Program, I was excited to see my original dream come to fruition! In the past two years, I have been trying really hard to work with local imaging brands, but to no success. I managed to secure a few loaners from Olympus (whom I maintained good relationship with), Panasonic, Canon and Sigma (special thanks to those friends and contacts that helped) but the review game only goes so far. Several brands were not supportive of what I was doing and they just did not see the importance of having a photography blogger reviewing their products. Some of you have asked why I had no reviews of products from Sony and Fujifilm, well the honest answer is – they shunned my request for loaners. Therefore, when Olympus Malaysia came to me with the proposal of me joining their prestigious Olympus Visionary program, I thought to myself, maybe it is time I stop trying so hard to win over people who never cared about what I do, and focus my energy on the one brand that has been with me from the start – Olympus. I have been using Olympus products for 10 years strong now, and I do not foresee myself jumping systems anytime soon. I have spoken to MT about this, and we both agreed that the integrity of the site and our writing must be maintained and prioritized. I will continue to do what I do here, writing articles and sharing thoughts pertaining to photography. I will talk about my personal photography journey, my adventures, share what I have learned from my assignments, as well as continue to push the “shutter therapy” concept that I have been advocating all these years. What changes? For the next one year, I will exclusively use Olympus products, but will be careful not to mention or compare Olympus products with any other brands to avoid conflict of interest. Another significant change – I will not be doing any more product reviews during my involvement as an Olympus Visionary. I will however have an exclusive preview of products before launch and will share my thoughts and personal opinion about upcoming new products. As usual, I will transparently state my involvement with Olympus at the start of such articles. MT also has oversight on what gets published here. So if anything sounds heavily biased or too “shill”, he has the authority to censor my articles. As for me, this is a personal, significant milestone in my life. Working for Olympus previously, I gained useful insight and precious experience on how an imaging business is run. However, being an Olympus Visionary, I am now finally recognized for who I truly want to be – a photographer. My deepest gratitude to everyone who believed and stayed with me over the years, thank you so much for the support. Here is what I can say – Shutter Therapy lives on! Congratulations to you, Robin Wong on your new challenges. Bravo, keep it up. Hope you every success as an Olympus Visionary. Thanks Alex, hope to see you soon during local events here in KL. Excellent news Robin, your enthusiasm for photography with Olympus cameras is contagious. Congratulations! Thanks Eduardolibby, I am glad I can do a small part to inspire others! Congratulations and blessings Robin! You are in good company as an Olympus Visionary and I am gratified to see that Olympus has recognized your diligent efforts as a blogger and a photographer. Thanks Geoff, appreciate the kind words. I am privileged to be included in the group! Congratulations Robin. I think this move will expand your global audience. I look forward to reading your thoughts into the (currently rumoured) new products next year and seeing your photos. Thanks Jason! I am very happy with my current audience, you guys are the reason why I am privileged and be able to do what I do now! Congratulations! I’ve enjoyed your writing and photography both pre and post MT. I’ll look forward to your continued work. Best wishes! Thanks for the show of support, Robert, and I appreciate your visits to both my blog and MT’s here. Thanks for staying with me, and surely more fresh contents are coming! Robin – thanks for keeping in mind very consciously the transparency and any potential conflicts of interest. I think that’s great. And congratulations for moving forward working doing what you love. Congratulations Robin! Looking forward to your future content. Thanks! Working on some fresh articles soon. Thanks so much for the kind remarks, and I am glad to be a part of the Visionary team. Looking forward to many more adventures awaiting. Thanks so much for the warm welcome and I appreciate the support! Nice to see your work and perseverance with the m4/3rds format paying dividends, Robin. Congratulations are in order! Thanks so much Terry, I appreciate the kind words. Cool! Looking forward to hearing all about the new E-M1X and new lenses! Hah, you know I should be tight lipped about any new products, but when the time comes, yes, I shall do my best. Thanks Keith, I appreciate your vote of confidence! I shall continue to do the same, and at the same time strive to improve my game, and as a photographer! I must say that it has been a privilege to see your work and wish you the very best going forward in your new role at Olympus. Hopefully the next one year will become the next happy decade with Olympus. They are lucky to have such a talented individual. Thanks Hugh for believing in me, and I will continue to shoot and share more here! Congratulations, Robin, and the best of good luck with your appointment. I appreciate what you share with us, and a large part of the reason for that is seeing what Olympus can do. Thanks for sharing your story and I am glad I am able to help your friend in his decision to get the PEN-F. Even MT is currently using it, and I am sure your friend is getting good results. Indeed it is interesting to see Olympus grow, and I shall do my best in helping them in whatever small part I play as a Visionary. Great news Robin. Olympus valued your expertise & your work and they picked the right person. I enjoyed all your Shutter Therapy articles and learned lot from you. I believe more to come from you as Olympus Visionary. Congratulations. Kalai, thanks so much, and it means a lot coming from a fellow photographer. We should catch up over coffee or something! Congratulations! Love your photographs, reviews and how-to articles. Thanks Eric! Rest assured more fresh articles are coming. Congrats on your addition to the Olympus Visionary program, your photography and writing will compliment their program. I have a friend, Frank T. Smith, who is also in the program. I haven’t commented lately because what can I say about greatness. Thanks so much Donald, you are being too kind! I will continue to do my best! Congratulations, and may I say it’s about time! Your photography and writing have been representing the brand well without compensation for years. Here’s hoping it pays, and with more than just a title. I have no doubt that your credibility will be maintained within this blog. The only editorial challenge facing Ming Thein will be moderating your irrepressible enthusiasm for the gear, a quality which always has been received as genuine by readers. Hey Michael, rest assured, Ming Thein was right when he said that, so far everything (my articles) published here were 100% me! I believe that having someone as credible as MT to overlook what I have to say is also helpful to keep myself in check! Congratulations. I always enjoy reading your articles. Even if you do not write reviews, your experiences with the Olympus Gear is what i like to read about. Sorry to say it this way, but i suspect you’re one of the few using Olympus in a professional manner i suspect. The only one i know using Olympus is now going back to his previous brand because it now offers mirrorless cameras too. So please push your Olympus Gear to its borders so we can estimate what it is able to do, especially the rumored upcoming new E-1 whatever…. Thanks Ingo for the vote of confidence, and I appreciate the kind words. I shall strive to do the best I can in my writing and I sure hope more new “stuff” will pop up soon! Stay tuned! Robin – I am so happy for you! You have always been a visionary to me. Your blogs, advice, passion, has always been an influence on my purchasing decisions and my own growth as a hobby photographer. I am now the family member that is always asked to take pictures at our family gatherings. I want to thank you for that. I can’t wait to see what is in your future with Olympus. Congrats!! Thanks Jerry for the very kind words and letting me know. I am glad I could help in whatever small ways I can, and I hope you have been enjoying the camera and lenses you have purchased. I shall continue to do my best as a photographer and blogger! Congratulations Mr Wong! Your reviews on Olympus gears had huge impact on my buying decision. Thanks Edward for letting me know and I do hope you have enjoyed shooting with the Olympus system! That is awesome, Robin, I have been following your work for years. To celebrate, I will go out on a shutter therapy session today, although it is not quite the weekend yet. Congratulations from Miami, Florida. Thanks Isabel, I could not think of a better way to celebrate! Lets all go out and have Shutter Therapy! Great job! I like your work Robin! Congratulations Robin! You may have not been called an Olympic Visionary before, but it was your work and blog that influenced me to buy an Olympus EM-5 mark II and a a number of Olympus lenses nearly four years ago. I enjoy your work. I wish you the best. Thanks David, I am glad I helped a little and be able to contribute in whatever small ways I can to the community. I hope the Olympus E-M5 Mark II has served you well! Robin – – great news! 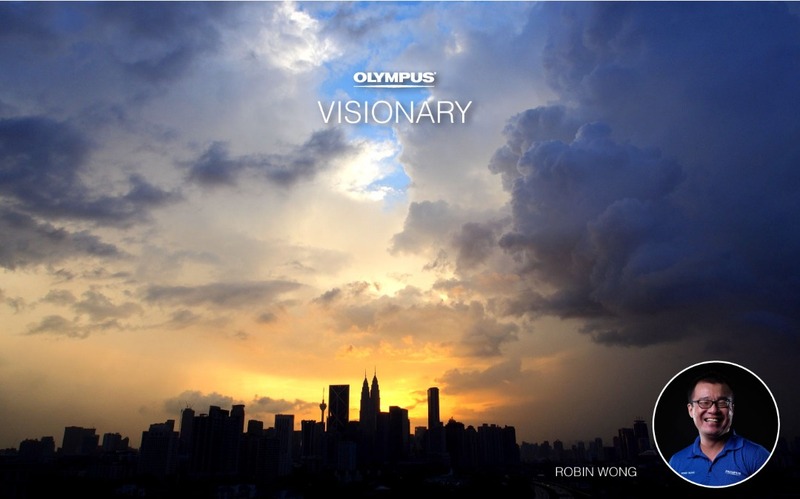 Full circle with Olympus; Global Visionary sounds just right. Your images and your words about your experience with the E-M5 and the various Pen models that you took out on the street opened my eyes to M4/3 and the beauties of the Olympus and M.Zuiko lenses. Using these tools while watching your discoveries and explorations has been a delight. My photos, inspired by your vision , have introduced the landscape and critters of Australia and California to people who otherwise would never have shared those vistas and worlds. So I am in your debt and I couldn’t be happier to know that you are now officially, somebody whom you have been in fact, for years: an influential Olympus visionary. Congratulations! Thanks Reverend, you are being so kind and supportive all these years. I must find the opportunity to meet you in person some day and maybe have a shutter therapy with you! Congratulations Robin. I’ve been following your blogs from the US for a good while and am excited to continue reading, exploring, and learning from you in your new role. Best wishes! Thanks David for the constant visits and support, exciting times ahead indeed! Congratulations Robin! Very happy that Olympus has recognized your photographic skills in this way. I’ve learned so much about photography and how to use my camera, from your and MT’s blogs (and subsequently both of you writing here), and look forward to seeing your upcoming images and writings! Thanks for the kind words, Ken, appreciate your constant visits and I shall continue to share photos and write new articles! Thanks Paul for the kind words! Congratulations on your new title as Olympus Visionary and ambassador. It is rightly a great recognition for your artistic qualities and years of efforts as a photographer. Also for your qualities as a journalistic author to share your thoughts about a camera or photographic subject. I am convinced that your future reviews of Olympus equipment as Olympus visionary will be just as valuable to the reader as before you were an Olympus ambassador. For comparison: I enjoy reading the articles of photographer Jonathan Slack, a Leica ambassador. He starts his reviews with the following disclaimer: “My role with Leica is to test the cameras, not to write reviews of them, and it’s important to understand that this article is not intended to be a critical review. If I find something wrong with a camera, then I tell Leica. Having said that, this article is my work, nobody has suggested what I should write, and I certainly wouldn’t say anything that I don’t believe to be the case or omit anything that seemed to be an issue.” Yet I find his articles have been written very carefully and are valuable to me. Personally I like to shoot with Leica M and Olympus OM-D. I think these two relatively small brands contribute much to the development of photography and photographic art in general. I wish you every success in your new position as Olympus Visionary and hope to be able to read many articles from you in the future! Thanks for referencing the Leica ambassador, I am doing the same thing moving forward, I will not be doing “reviews” anymore, but maybe something along the lines of “Robin’s Impressions”. That, and also stating clearly from the beginning my involvement with Olympus as a Visionary clearly, being as transparent as I can. I will still continue to shoot like I always do, and test the cameras or lenses similarly as before, hence the article style and writing approach shall remain the same. Thanks again for the support and I appreciate your input. Yes, like everyone else here, “good on you” as we say here (and which you probably remember!). Your macro insect work is exceptional. Keep going. Thanks so much, I have not been shooting insect macro much, I shall find myself in the jungle very, very soon! Thanks for reminding me. Thanks Christian, as I mentioned, Shutter Therapy goes on! My cameras and most of my lenses are Olympus, and the choice was greatly influenced by reviews by a photographer named Robin Wong. So many thanks for that and my best wishes for your new life as a Visionary. Olympus has made another good decision. Thanks John, appreciate the kind remarks and support! Hope you are enjoying the Olympus system thus far! Congratulations Robin.. Very well deserved. I’m proud to be part of your Shutter Therapy sessions every now and then.. Thanks Van! You should come more often, we all miss you! Congratulations Robin. Always loved your “down to earth” way of looking at photography. Hope that you continue to be as prolific (about writing in this blog) as before. All The Best! Thanks for the kind words. I shall do my best and continue to share my photography and passion here! Huge congratulations Robin. Never has it been more deserved. Thanks Dr Haris! I am looking forward to the new products too. Congratulations! Olympus is lucky to have you. Congratulations again Robin, I first saw you on the Olympus Malaysia Facebook post last night and was thinking, “Oh, wonderful, Robin finally made it! And didn’t tell me! 🙂 ” You have been putting a lot of work in the technicals of both Olympus and Photography and cameras, this is an excellent reward for your efforts. Nice to know good guys make it in this world. Haha, thanks for the kind comments, Ananda. Lets catch up again whenever you are coming back to KL. Congratulations Robin! Looking forward for your next photographs and projects!! Thanks! Working on new stuff and all in progress now! Congratulations! I am very happy for you and look forward to seeing your new images. Thanks John! And yes there will be plenty of new images coming soon! Wow, congratulations indeed! I can imagine this being very exciting and rewarding and I feel happy for you thinking about this news. Thanks Tom! It was indeed exciting and rewarding, and I can very thankful to receive the Visionary status! you are good at what you do Robin and Olympus is wise to add you to the Visionary Program. Thanks Harvey! Appreciate the kind words.